You are here: Home / Featured / NOT the national anthem ! A feeling of insecurity is an odd thing. It brings out the worst in people or what we think is the worst. But is it easy to be expansive after some 450 years of colonialism and many years of ethnopolitical conflict and bloodshed to save the country from being divided? I think not. Yet historically we are not pure Sinhalese living in a country where we ‘let’ other people live in it beside us. It is not Sinhalese land in which others live, are accommodated—it is a nation, Sri Lanka, of Sinhalese, Tamils, Muslims and others. During the 83 riots the Tamils of this nation realized that they had no protection. They felt they would never be first-class citizens of this country, never truly belong. That too is insecurity and that is not a good thing. It brings out the worst in people or what we think is the worst. The Tamils are very grateful to those neighbours of Sinhalese, Muslim and Burgher for saving them and sheltering them. But they don’t want to be saved. They want a guarantee that this will never happen again. That the State will protect them. That they belong as much as the Sinhalese, not more, not separate, but within Sri Lanka. We may not fully understand this gesture by the State, but could we understand what it means to the Tamil-speaking people which include both Tamils and Muslims in Sri Lanka? It says yes, we have a trust-deficit. It says you belong. You have a place in the sacred expression of allegiance and pride in our nation. Multiplication of interpretation is not the same as division. We have everything in Sri Lanka, everything. In this unique country we have everything from Buddhist philosophy to Hindu to Christianity to Islam. When you live in other countries you wonder how on earth they know so little about the people they’ve lived with for generations. That makes them insecure and insecurity is not a good thing. It brings out the worst in people or what we think is the worst. To them, the Muslims and others are migrants governed by a policy. Whereas, in Sri Lanka, thanks to being geographically in the way of maritime trading routes, we have Sri Lankans who belong to Sri Lanka and are from diverse faiths and diverse ethnicities—the integral diverse parts of ‘Us’. It all depends on how you view your country and what you call a rich legacy. It depends on whether you know how very special that is. 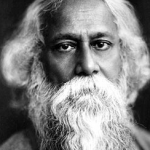 Tagore would be proud to hear the words he composed in Bengali (yes, according to sources, it was Tagore who either inspired or composed a first version, and translated and changed further perhaps by Ananda Samarakoon to be the national anthem of Sri Lanka), being instrumental in a supreme gesture by the State to say ‘You are not second-class citizens in this nation— you belong’. With thanks to Dileni Gunawardene for sharing the Tagore poem as her wish on Independence Day.